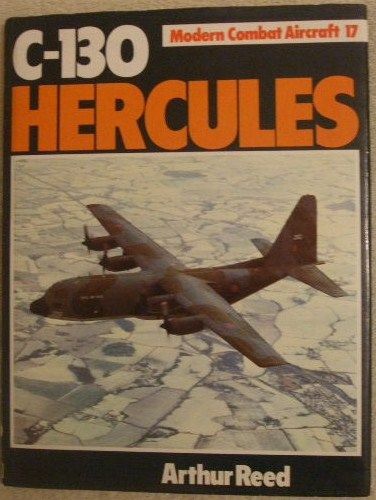 First edition, first print hardback of C-130 HERCULES - Modern Combat Aircraft 17 by Arthur Reed and published by Ian Allan Ltd., London in 1984. The book is in very good condition (Clean blue cloth boards with gilt lettering on spine) with only minor shelf wear to the illustrated dust jacket, which is not price clipped (light creasing to the edges). Internally, the pages are clean and tight and there are no tears and no inscriptions. "The seventeenth in Ian Allan's acclaimed 'Modern Combat Aircraft' series examines not a supersonic fighter or a swing-wing bomber but an ordinary turboprop transport aircraft — but what an aircraft! Conceived in the aftermath of the Korean War, Lockheed's C-130 Hercules has proved to be one of the classics of the postwar aviation industry, following in the footsteps of the inimitable Dakota. Over 1,700 have been ordered by operators in more than 50 countries. It has been built in over 40 military and civil versions, and plans for further 'stretching' will extend its lifespan into the 1990s and the 21st century. It has seen use in war — during Vietnam and more recently the Falklands on both the British and the Argentine sides — and has been proved to have that most important of combat capabilities, 'survivability'. It has seen use in peace, flying relief programmes for government and international agencies throughout the world. Earthquakes and famines, tidal waves and typhoons, they have all been the same to the C-130s whose crews — wearing the insignia of many nations — flew into and out of areas that other aircraft couldn't contemplate. From Arctic to Antarctic, Vietnam to Peru, as a gunship, freighter or troop carrier, landing on snow, sand or even the deck of an aircraft carrier, performing in an aerobatic team or as a water bomber — the C-130 has done all this and more, and its development, history and continuing story is admirably covered in Arthur Reed's fifth book in the series." Appendices: 1. Hercules Orders/Deliveries by Customer; 2. C-130H/C-130H-30; 3. L-100-30 Super Hercules; 4. HC-130H Characteristics; 5. KC-130R Tanker/Transport Characteristics. 112 pages. Illustrated with black & white and colour photographs and drawing to end-papers.